Home >> Featured >> Featured News >> Caravan Swells to 7000, Vows To Reach U.S.
Caravan Swells to 7000, Vows To Reach U.S.
Last week when FOX Talk show host Sean Hannity was interviewing Rush Limbaugh Rush wanted to know who is funding these migrant caravan people, what and how do they eat and where do they go to the bathroom. I would like to know that myself and wonder where they go to the bathroom and what and how do they eat. I assume they just urinate and defecate on the streets on the way since there are now 7000 of them walking on their way here from Honduras and Guatemala. Upon doing some research I found out how they are being funded. So we are expected to believe that just out of the blue, 4,000 people in Guatemala just decide to gather together and without resources head to a better life in America. What does this say for the country and government of Guatemala? And of these 4,000 some odd people no one had sought asylum or requested a legal option at the US embassy? And just three weeks before the midterms? The media is loving the suffering of the children in this political game, make sure they are crying and up front behind a fence and blame Trump and Republicans. The financial and political connection between Soros and the radical pro-immigration activist group was revealed last month. His interference with national borders is challenging numerous governments’ customs policies so that he can unleash his global mass-immigration movement, which is being countered across the globe. Former AILA President Victor Nieblas Pradas is behind many of the Soros-led caravans and contends that detaining mothers and their children who break into the U.S. illegally is inhumane, unfair and unjust. 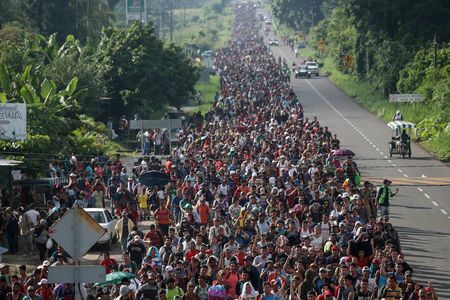 With the CARA coalition being officially announced last week, it was also reported by (World Net Daily) that other groups financially supporting the northbound Central American migrant caravans through Mexico include the Ford Foundation, the Carnegie Corporation and the MacArthur Foundation. “Alex Mensing is one of the organizers of the Pueblo Sin Fronteras group, [who is] serving as an official spokesman at the border,” WND informed. “While identifying himself as a paralegal at the University of San Francisco’s Immigration and Deportation Defense Law Clinic, he also works with CARA [and] regularly briefs leftist website and magazine Mother Jones. His interference with national borders is challenging numerous governments’ customs policies so that he can unleash his global mass-immigration movement, which is being countered across the globe. His ultimate goal is a one world government which is what Obama and Hillary also want. They are puppets for Soros. In fact, the very name, “Pueblo Sin Fronteras” – translated “People Without Borders” from Spanish – is derived from the group’s objective of “abolishing borders” – which was highlighted by the group when the caravans to the US border started n March to pop within borders and let everyone in, crime, terrorists and everything else all in an attempt for power for them and the destroy what’s left of the United States so they can Have their New World Order of government dominance over the citizens. I’m beginning to believe the accusations that Democrat operatives have been sent down to these countries to spread the message that America is taking in anyone, with jobs galore. Reason, its planned to happen just before the midterm elections and will help Democrats get elected. It used to be that when a person emigrated to this country they were required to have a job, a place to live, and a sponsor who would ensure that if they lost either of them they’d take responsibility for their needs until he could get another job or place to live. They were also required to have a working knowledge of English. What has happened in the last 50-60 years that these are no longer requirements? Repel the INVADERS. Nobody cares if INVADERS are shot !!!!!!!!!! The caravan started in Honduras NOT Guatemala! It seems somewhere in the Bible there is a passage that talks about the prosperity of the wicked. It wasn’t written by George “THE GOD” Soros who is more vile than the Emperor in Star Wars – holliwood is wholly incapable of making up that kind of evil. At any rate how many God fearing Americans have cried out for vengeance against the likes of soros, hrc, steyer, the rockerfellers, and others who have so much money as to buy power and manipulate countries at their own pleasure. When? When….? But they haven’t really prospered yet have they – their goals being to Steal the entire planet (buy with money they have stolen and murdered for)? They haven’t done that yet. “I am the Way the Truth and the Life; no man approaches (the Blessings of) the Father but by Me – Jesus the Anointed. Hey, not my words; I just know that means in the end the TRUTH always wins!